So you’re the type that likes your web to truly be worldwide. 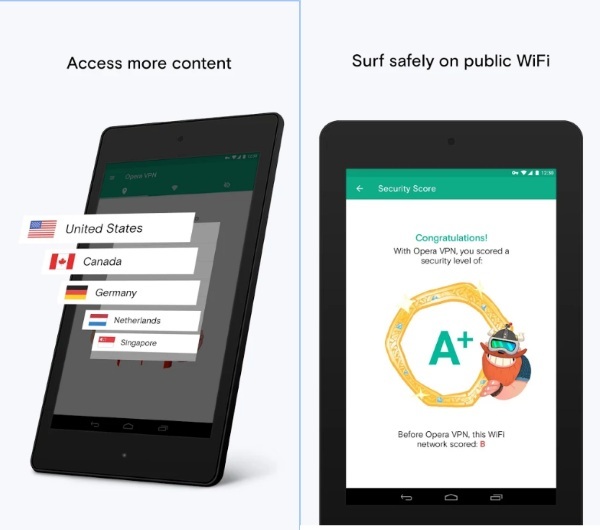 Forget being confined by your location, view everything as if you were anywhere on your mobile device with Opera VPN, the app that lets you enjoy more online safely, all for free. Currently, there are only five virtual locations that you can choose from but that’s four more than you had before installing the app. They are working on adding more to the lineup to grant you more access to the web. On the day to day level though, this app really shines as a way to block ad trackers and give insight into public WiFi security. Using this app will allow you to determine how safe the connection is so you can use it with confidence (or avoid it, also with confidence). This app is available for both Android and Apple products and is completely free for use. Enjoy your online adventures no matter where you are!